"Economic Stimulus 2009", "Economy", "Financial crisis", "Financial rescue", "Government", "Laissez Faire"
It's hard to prove a negative. But in the recent political and socio-economic climate, it is important for us as a country to answer a question: did government action prevent a second great depression, and if so, to what degree? Suppose, for the purposes of understanding the effects of government action in what used to be a free-falling economy, a model could be constructed that would estimate where the economy would be without those government actions. Suppose an expert analysis could be conducted to predict what would have happened if nothing were to be done. Without the government’s response, GDP in 2010 would be about 11.5% lower, payroll employment would be less by some 8½ million jobs, and the nation would now be experiencing deflation. The response to the economic disaster left behind by years of market deregulation and unchecked corporate greed can be characterized in two parts: fiscal stimulus (direct spending and tax cuts by the government), and financial stabilization measures (stabilizing banks and the financial system as a whole, such as TARP and Fed actions). Both of these turned out to be crucial parts and working in tandem. The study estimates the impact of the financial stabilization measures had a greater impact than fiscal stimulus (we will discuss why below), but the impact of fiscal stimulus by itself is nothing to scoff at. the effects of the fiscal stimulus alone appear very substantial, raising 2010 real GDP by about 3.4%, holding the unemployment rate about 1½ percentage points lower, and adding almost 2.7 million jobs to U.S. payrolls. The lion's share of the fiscal stimulus of course was the American Recovery and Reinvestment Act passed over almost unanimous Republican objections last year. The total cost of fiscal stimulus (direct spending or tax reductions) amount to about $1.07 trillion so far. There is no surprise in terms of the study's findings about what fiscal stimulus is most effective and what is least effective. 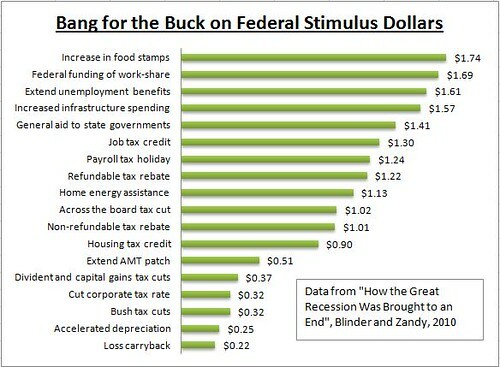 I have prepared a chart using data from the report by Zandy and Blinder to show the effects of each type of stimulus. The term "bang for the buck", commonly referred to as economic activity generated per federal dollar spent (or not received due to tax reductions) means the amount by which our GDP increases for every federal dollar spent in direct spending or tax cuts. As you can see, cutting taxes on corporations and unearned income (dividents and capital gains) are the worst stimulative measures, while spending on food stamps, direct federal assistance for jobs and unemployment benefits are far and away the best. For example, every dollar spent in unemployment benefit generates over 5 times the economic activity as every dollar of Bush tax cuts. Fiscal stimulative measures have been criticized as being too small, and by and large, those critics are right. Targeted spending on high-yield stimulus measures are proven ways of spurring economic growth, and we should do more of it. Nonetheless, given the current political climate, what we have been able to do is astounding. They have not only held unemployment from falling off a cliff and saved jobs, but prevented countless foreclosures, kept food on the table for families and individuals, and have fueled needed consumer spending (that support jobs). It's important to understand why the financial response measures end up having a greater macro-economic impact than fiscal stimulus measures. There is not doubt that only fiscal stimulus measures can directly put people to work or deliver money in the pockets of those who need it (in the form of unemployment insurance, for example). In addition, no one can be blamed for distrusting the CEO's and bankers on Wall Street. That distrust, however, should not be allowed to cloud our judgments in terms of the huge role our financial system plays in our lives. 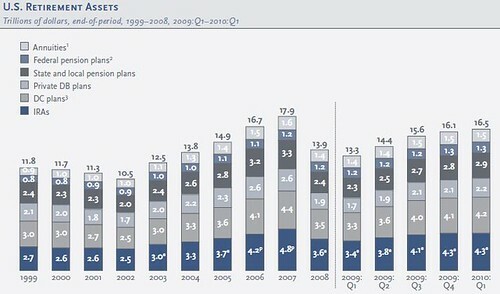 $2.7 trillion in individual retirement savings (401Ks, IRAs) evaporated between September 2007 and May 2009. Today, the losses are by no means completely recovered, but retirement assets are starting to see a comeback. According to a Investment Company Institute research paper published this month, since President Obama has taken office, total US retirement assets have gone from $13.3 trillion to $16.5 trillion, a stunning 24% turnaround. Retirement assets account for 36% - that's over a third - of all household financial assets in this country. And it's not just overall retirement assets. Individual retirement plans (which do not include annuities and state and federal pension plans) are making a comeback as well, and even a little stronger. They bounced back from a low point of $3.3 trillion to $4.2 trillion (as of Q1 2010), an even more remarkable 27% turnaround. This is why stabilizing the financial system was so important - even when it meant helping the banks and investment institutions that gambled and brought the economy to the brink of disaster. There's a moral argument for letting them all fail, but doing so would wipe out trillions more in Americans' retirement savings, whether it's for the company holding their investments going bankrupt or because of the stock market crashing further due to banks failing. A devastated retirement portfolio usually results in restricted consumer spending, as people become more worried about their retirement savings and save cash. It also keeps people working longer, making new jobs open up later, and thus exasperating unemployment. These numbers also show you the massive scope of the problem, and there is no way direct government spending alone could make up for these types of massive losses. You cannot make up over $4 trillion in lost retirement assets with a roughly $3 trillion federal budget. To this day, many believe the TARP was a costly failure. In fact, TARP has been a substantial success, helping to restore stability to the financial system and to end the freefall in housing and auto markets. Its ultimate cost to taxpayers will be a small fraction of the headline $700 billion figure: A number below $100 billion seems more likely to us, with the bank bailout component probably turning a profit. The auto industry rescue program that has seen it add 55,000 jobs, the strongest period of job growth in 10 years, was funded by money provided in TARP. Recall also that financial rescue measures did not simply include saving the bottoms of big banks. It included rescuing mortgage giants Fannie Mae and Freddie Mac, which together with the FHA now back 90% of new mortgages. It included the wildly successful (and environmentally friendly) Cash for Clunkers program. Here's the other story that escapes the public consciousness at the moment. The monetary (financial) policy rescues are now estimated to cost us far less than originally thought. Most of the help came in forms of loans and loan guarantees to financial institutions, and most of those initiatives are ultimately expected to cost very little. Even the collapse of AIG is only estimated to cost $2 billion when all is said and done. In fact, the only significant monetary policy expenses - that is money that is not recovered - is expected to be the cost of rescuing mortgage giants Fannie Mae and Freddie Mac at $305 billion, TARP at $101 billion, and bank resolutions at $71 billion. That's a total of $477 billion. If you read the report by Blinder and Zandy closely, you will see that the whole of economic rescue provided by the fiscal and financial policies is greater than the sum of its parts. This is expected because each interact with and reinforce the other. To illustrate this dynamic, consider the impact of providing housing tax credits, which were part of the stimulus. The credits boost housing demand. House prices are thus higher, foreclosures decrease, and the financial system suffers smaller losses. In turn, for example, when due to a smaller loss in the financial system, someone's retirement portfolio suffers less, they can spend more (rather than having to save it for retirement) and help the economy bounce back. When all is said and done, the financial and fiscal policies will have cost taxpayers a substantial sum, but not nearly as much as most had feared and not nearly as much as if policymakers had not acted at all. If the comprehensive policy responses saved the economy from another depression, as we estimate, they were well worth their cost. What's the lesson from all this? We have been discussing how federal response staved off a great depression and where the laissez faire ideas of doing nothing - in the current climate advocated generally by Republicans - would have left us. The scope "government response" or "government action" includes actions undertaken by Congress, federal regulators, as well as the Federal Reserve. I know there are particular portions of the political spectrum that love to hate one or more of these institutions, but for the time being, setting aside one's pre-ordained notions and looking at the data and expert analysis, one thing is clear: government intervention in the economy to stabilize it works. The Great Recession and its end by government action is the ultimate repudiation of laissez faire economics. Just as the government is left as the last resort to take action to prevent a total catastrophe, so it is the government's job to regulate our financial sectors to make sure that a catastrophe does not come close to it in the first place. An ounce of prevention is worth a pound of cure, even in the economic arena. Now that a second great depression have been staved off, we need to focus on two things: strong financial regulations (which had a great start with the financial reform bill), and additional targeted investment in high-yield stimulus measures.